I couldn’t resist riffing off of the Lexus commercials we have ad nauseam in the US this time of year! In my case I’m working on engines. And I'll rebuild another 175cc engine. 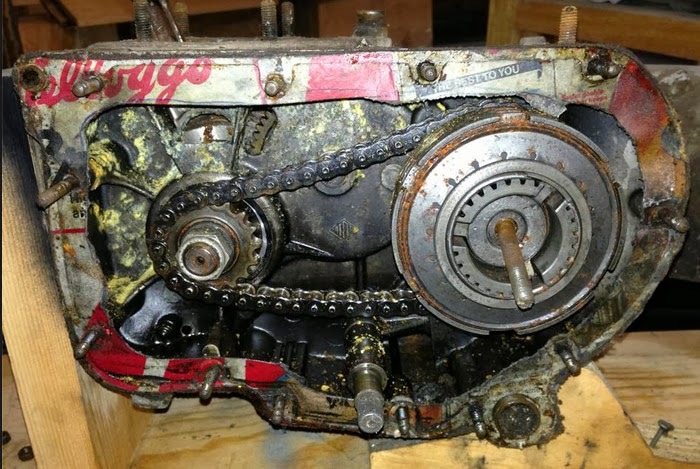 Why buy a clutch cover gasket when you can use a corn flakes box? 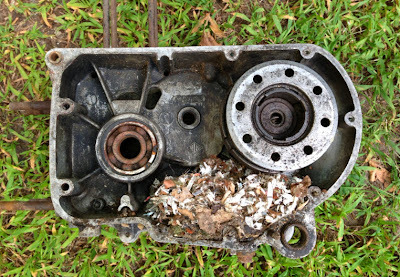 Any parts in this engine case have been replaced by mice! I don’t even know how this clutch worked. Whoever reassembled it put the clutch actuator behind one of the plates, and still managed to assemble it. Luckily nothing seems to be wrong with it (that I can tell yet). You can’t get a round muffler, so this was a pretty good fix. The tailpipe “bends” are mitered quite nicely. I knew the fans had different part numbers, but I counted the number fins and lined up the mounting holes and thought I was in the clear. Wrong! One fan is taller than the other, and correspond with a lower profile magneto side engine case cover. A tall fan can't turn inside a short cover. I learned that except for the housing portion all of the other key measurements seem to be exactly the same. This hub is crusty, and I didn’t notice until I took it off that someone had made an elegant hub repair. The steel center (portion with the splines) was removed and replaced. Nice job! 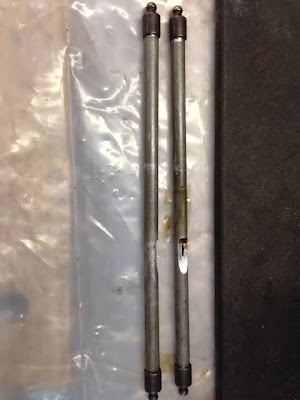 Sometimes pushrods are slightly worn from rubbing on the cylinder head. Usually you can fix this by shimming the rocker arm at the front, thereby pushing it slightly backwards. Heinkel Pushrod- Worn or Sanded? This next set has a lot of mystery wear. More than corners were cut here, most likely because they were they were trying to line up these pushrods with the wrong rocker arms (200 cc rocker arms are several millimeters shorter). Not a Pipe Organ Part- A Heinkel Pushrod! This was on one of my wheels. I posted a photo on Facebook and got a number of responses. Best answer? Flag holder for the back of a Heinkel scooter. Yeah, I can see that!